For many vehicles, the manufacturer provides an ideal mileage limit to observe for timing belt replacements. Even when sticking to a schedule, it's possible your vehicle could end up needing the part replacement early. Watching for common signs of timing component failures – hard starts, dark gray exhaust, poor idle that shakes the car, frayed or split belt edges, and squeaky tensioner – can help you protect your engine. 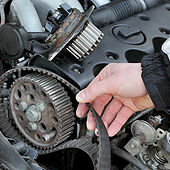 If you’re experiencing any of these issues, our experienced technicians can quickly and easily confirm the diagnosis of faulty timing belts before proceeding with a replacement. Stop by, give us a call or request a quote below!